JMH: What is Horse Power G? 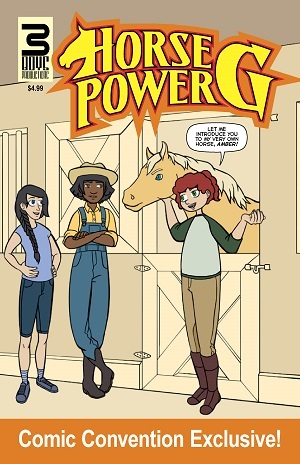 TERRY: Horse Power G is a new family-friendly comic book series written by Terry Cronin, illustrated by Savannah McKendree, colored and lettered by Gary Scott Beaty, and published by 3 Boys Productions. It's a truly unique innovation in comic book storytelling. If read from front to back it tells the adventure from the human point of view but if read from back to front(manga-style) it tells the story from the animals' perspective. JMH: Can you describe the world/universe it’s from? TERRY: The story follows 13 year old Gertrude and her friends, Maggie and Victoria, who love the horses at the Tooth Acres Stables and farm. Gertrude doesn't like her name and prefers to be called "G". She and her friends are trying to learn how to take care of horses while learning to ride, barrel race, and show. What they don't know is that the horses have a culture and community all their own. When read from the back, the story follows Queen Amber who is the royal leader of what the horses call a herdhome. She has recently heard rumors of a new stallion in the stables named Mysterious. JMH: Does Horse Power G have supporting characters and if so can you tell CBI about them? TERRY: Absolutely. On the human side, there is Gertrude's younger brother James, who her friends find bothersome, but G appreciates for his loyal support of her passion for horses. G and James' parents Frank and Elizabeth are also a part of the story because Elizabeth doesn't support Gertrude's passion for horses and thinks this is a very dangerous hobby. Kathy is the owner of Tooth Acres Stables and PJ the farrier and cowboy works for her. On the animal side, there is Cabbie the goat who is the confidante of Queen Amber. He is somewhat particular about manners and only ever happy when he's eating. There are also three scheming mares led by Ellie who would love to replace Amber as queen. There is also a miniature gelding named Shetland who can't keep his nose out of other horse's business. Cuticles is the barn cat who pretends to be above barn politics but finds it quite enjoyable spreading whispers to help stir up trouble. JMH: Was Horse Power G inspired by anything from your past or real life experiences? TERRY: Yes. I have been writing comics and novels for a long time and my wife hasn't always found it as exciting as I do. Her passions are more about gardening, horses, and horseback riding. A lot of my previous creative work has been in horror and scary stories for Students of the Unusual and Indie Comics Magazine. When I'm at comic conventions and book fairs, parents would often bring their children by because they saw our comic books and I'd actually have to talk them out of buying my books for their little angels (because they are just too scary). So one time, I was talking about these problems with my friend and frequent collaborator Pat Martin and we came up with an idea that would get all-ages to enjoy a comic book story. One that is especially appealing for adults but definitely for kids and teenagers too. So Horse Power G was born. 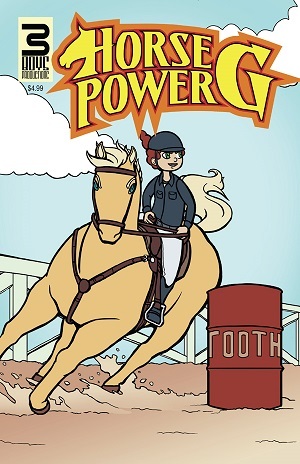 And I hoped Horse Power G would help my wife enjoy the comic book world as well. TERRY: I think the greatest message is that there are "always at least two sides to every story". It's really a lot of fun to read the story from the human perspective and then read the story again from the animal's point of view and to see how different they are. TERRY: Savannah McKendree is the talented artist who gives Horse Power G its distinctive look. She is a graduate of the Savannah College of Art and Design. Gary Scott Beatty is an professional colorist and letterer and his art design has been instrumental in giving Horse Power G its polished look. He also designed our distinctive logo. 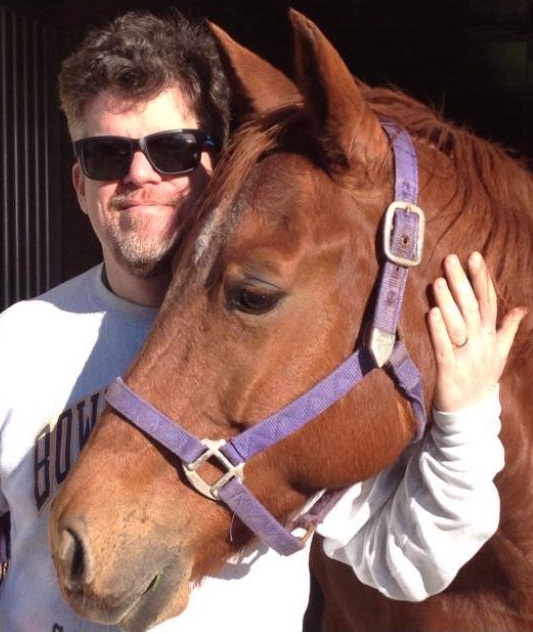 Terry Cronin is the writer/creator of Horse Power G. He has published four novels and a series of comic books. JMH: Will Horse Power G be released in digital format, web comic, or print? TERRY: Because of the unique method of reading Horse Power G, there may be some troubles in translating that experience to digital formats. It truly is a story-telling gimmick that works best in the comic book medium as an actual comic book. We will be exploring other possible formats soon. JMH: Where can readers get a hold of Horse Power G? TERRY: It is currently available on Amazon.com and you can certainly get it at some of our convention appearances at Megacon, Florida Supercon, and San Diego Comic-Con. JMH: How can fans contact you? JMH: Finally, is there anything coming up in further Horse Power G stories, or other projects you want people to know about? TERRY: Thanks so much for this opportunity John! We're preparing the third issue of Horse Power G which will hopefully be ready for San Diego Comic-Con in July. After that, we're preparing for a larger distribution plan.